Does your dojo or governing organization have karate uniform etiquette? I had this question that seems to come into my thinking from time to time. Why is it there is such a disparity between students as to uniforms and how they are worn. I am wondering if anyone else has "uniform etiquette for the dojo" other than myself. I am asking the readers of this blog to comment as to any requirements their dojo or governing organizations ask their participants to follow when wearing a karate-gi. 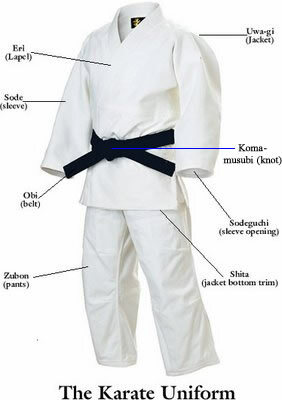 First, I am narrowing this down to the "traditional white karate uniform made of medium to heavy weight cotton." The one that is tied at the waist and the jacket with string, lay of jacket is left over right, etc. If you have such criteria, rules or requirements I am interested in how you do it at your dojo, etc. so ask for comments. If you prefer to you can send me a response directly to the email account on this blog. What's up with the Loose Knot? Recently I asked a forum group if they could identify the term used to describe the knot used to tie the martial art obi, i.e. karate, judo, etc. I was visiting a dojo recently and noticed a trend, maybe, of black belts wearing their obi with the knot loose. It was not a tight but one that had clear space around and through the knot that you could see through across the room. Apparently black belts are not the only ones as the only snap shot I could find was the one you see here. I wonder what this says about the person if anything. I can say several thoughts traveled through my mind. Much like the time in a dojo where I was a guest Sensei I observed a black belt wearing a clean but very wrinkled karate-gi. The obi was not even at the ends, it was very very long (almost down to his knees) and it was tied loosely with an open knot and down around the hips cocked forward and his thumbs were hooked into the front by the loose knot with feet far apart, etc. Does this speak to the person's attitude? Does it speak to his position as Sensei or Associate Sensei? What does it, if anything, say as to this person's ability to lead? This seems to fall under the requirement that once a person decides to be a black belt and especially to "teach" that they must assume a certain level of professionalism that speaks, projects and feels like someone who leads by example. What you say and "do" speaks volumes beyond mere words spoken. Communications depend mostly on such things as the body language. What you project tells more than any certificate, any trophy and any color belt. I have seen "kyu graded" folks who project more than some very highly graded karate-ka. I will admit that some of my examples fall into the category of military bearing. This is due to my history, training and belief system but if you were in a meeting and the chairman walked in unshaven, hair disheveled and wearing pajama's (no pun intended toward the gi :-) would you have respect for that person? The adjacent picture of the karate-gi with naming is one that projects, from my beliefs and views, what a karate-ka should look like in the uniform. Note that the belt is comfortable, secured properly and of a acceptable length. A pressed uniform with the body maintained, i.e. fingernails trimmed, hair neat, body clean and oder free and so on, denotes a person who cares about themselves and cares about what they project to those who are going to look up to them in the dojo, yes? Remember the old ad, dating myself, about the new memorex cassette tapes to promote their reliability and reality based quality? I have been studying how the mind works as it relates to reality and how that also relates to our beliefs. I highly recommend the book and am providing to you the reader the below graphic to demonstrate that what we see is not always what we might believe. The question then arises, how do we know what we see in reality based fights, violence or just plain everyday occurrences is real or matrix mind perceptions. The book inspires some interesting and thought provoking questions for each of us. This is a large graphic of many interesting illusions so click on the picture to view the whole. Let me know your thoughts, etc. Just to let interested folks know I am moving forward nicely with the eBook on the Ken-po Goku-i. I am slowly processing all my past posts and articles on the subject as well as integration of current knowledge into the book. Once I get a general layout done I plan on working on the editing of content to clean it up some and update those older writings. Once integration, editing and layout issues are in a very rough state I have plans to pass it along, in pdf format, to several courageous volunteers to read and provide comments, corrections and critiques so I can continue to rough draft <some number as I go past the initial one>. I am enjoying the process. I am working to be a writer so that when I retire I can write fiction. I have some outlines and other such notes started for an idea I had while meditating a while back - progressing well. This eBook is a good start in that direction so I can get things like flow, continuity, meaning, etc. in order before I attempt to put fiction in place. I have all the material so I can focus on the fundamentals/basics and practice, practice, practice. Most important I can train my ego to allow that my writing is going to need lots of tough skin ability so my ego and pride don't hinder my desires as a writer. Anyway, just wanted to give an update to those who may be interested. Ok, you martial arts experts. What is the knot used to tie the obi in marital arts, karate, called in Japanese? Take a cultural type tour of Okinawa that gave birth to many of our current systems of karate. This site is nicley provided for those who have not had the pleasure of a personal visit. First, Do you think each kata is more difficult than the previous? No, I don't. I think it is more a matter of fundamental principles of martial systems where a certain body type, body ability of an individual, etc. dictates whether a kata is either more difficult or easier to learn, etc. I found that some of the supposed higher level and difficult kata in Isshinryu were actually easier to learn than Seisan. This urban legend of difficulty order is not anything more than the order in which Tatsuo Sensei decided to teach. There is no proof that he said one way or the other that Seisan is the easiest so it was first. We can assume many things. Since there is no actual written evidence directly related to Tatsuo Sensei then it is best to assume this is false. In many writings I have had folks of other systems say that kata that are the same as ours are either advanced or basic depending on who and when you talked to that person. Subjective. Difficulty is subjective to many mental and physical factors of the individual. A good Sensei will be observant, seeing, of a practitioner and then adjust teaching accordingly. Like a person who is sight dominant where seeing Sensei do it is efficient vs. a touch dominant who relies on kinetic teachings to really grasp the kata. Second, Do you think each kata builds upon the previous? I find this to be a kind of urban legend. In my view kata are separate and distinct. I have come to the conclusion that how kata ended up as many in one system or style is due to the early karate-ka studying several kata from several Sensei and deciding to blend them into a new and "better" system. Tatsuo Shimabuku Sensei just followed the trend of his Sensei. He studied and focused on certain kata and techniques then pulled them all together and named the system Isshinryu. If you study and are familiar with the other systems you may find that they are merely the blending and changing of kata from various sources into one system then named by the person or by some specific trait of the new system, etc. I am not saying this is bad but rather stating that when they pulled things together into the new system that all of them stood alone, distinct and separate in training and practice. It has been said in Isshinryu circles that the upper/lower basics naturally lead to kata but I find that a bit hard to swallow as well. You can take any "basic technique" from any system and there will be connections especially in regards to the fundamental principles of all martial systems. To say that they were developed as a lead to the kata and to say that Seisan is a lead in to Seiuchin is not accurate. You can make the connections easily enough but in a most literal sense it is not accurate. Not wrong, not right - just different. Is this saying that those who have that belief are wrong? Not at all, they are actually creating a nice metaphor or symbolism that is a great teacher and allows for maximizing learning the system - all bottles are good, they all serve a purpose! Third, Do you feel that kata must be taught in the original order as the system master taught? Teaching in a particular order is only a method of control and a method of teaching larger groups so you can evaluate, guide and control content and context. I would advocate that for "kyu grades" it is important to provide structure in learning. Once they achieve yu-dan-sha levels then it is also important to take them outside that structure/box and expand on a more "holistic" training regimen. I would say this transition is important. In addition I advocate that even in the "kyu levels" it is important to make some adjustments that will be conducive to the individual where individual mentoring, i.e. small size dojo members of two or three maximum, is paramount. This means close observations and then when kata are to begin Sensei chooses that kata that matches the individual closely be the start. In Isshinryu you have eight empty hand kata to relate to the practitioner in this more classical training system vs. the school house large class member system. A new term. It cannot be found in a dictionary or online, the Internet. It is a word I created today to explain the need for martial systems to recognize the two extremes, i.e. Yang-Atomistic and Yin-Holistic, in the practice of the system as a whole of all its parts. The new word is "oscillistic." Here is how I am defining it and it will be further explained by example. Oscillistic, the movement from one end of the spectrum to the other with focus, intention and purpose. The ability to move smoothly between a holistic aspect into a atomistic and back again. A fundamental of all martial systems in the application of the particular system in combat. In dojo kumite there are two distinctions as to fighting. It involves a perception of time. We humans live in or between two concepts of time, one being monochronic and the second being polychronic. Edward T. Hall, author of "The Dance of Life: The Other Dimensions of Time," using the shorter terms of M-time and P-time. M-time is very linear in its extreme position. One would say it is a form of time where one event occurs at a time to the exclusion of all others. Look at it as a direct focus on one task fundamentally blocking out other tasks until the one is completed. This is a simplistic explanation and you would benefit from reading the book and doing further research beyond this post. P-time is on the holistic end of the spectrum. One would say this is a form of time that allows many events to occur and be viewed, felt, heard as a whole entity. Look at it as a more multitask type effort. The practitioner is aware more of all events in their environment and is able to quickly move between one or more events as necessary. Both M-time and P-time, holistic and atomistic, etc., have as you would imagine both pro's and con's. A person who is dominant in one or the other and who is unable to move between both may suffer certain affects and limitations. Ideally one should be able to utilize either mode to live life and handle events, occurrences and scenarios. In marital systems a fledgling practitioners should gravitate toward the more atomistic using the focus and awareness of M-time. It is a learning stage where understanding and knowledge of all the parts at the lowest level, i.e. atom level, is important to build the base, the foundation, necessary to take the parts and reassemble them into the whole, holistic, of the entire system. It can be said that the holistic aspect of martial arts is the ability to see, hear and grasp the entirety of those individual styles to understand the cross over of fundamental principles and psychological aspects that are common and unchanging between the styles. The atomistic aspects kicks in for the individual styles that each clan or dojo practices. The style that has a rhythm, the synchrony -synchronic frequency, the resonates with all the participants making a cohesive dojo, clan or tribe. Now, how can I provide a distinct example to what is meant by Holistic vs. Atomistic before I blend them into the Oscillistic form. Back to the kumite. Most dojo teach beginners a very basic type of skill. It tends to be very linear. You can see this in tournaments, etc. where they tend to go directly forward straight into their opponent. It can be seen as a single line that is followed where the tori-uke move in a line forward and backward. You see this a lot. The more holistic aspect of combat is utilizing all directions and all sides along with variances in other dimensional directions. Now how can I get this from the words to the mind. Take a look at youtube clips of typical karate kumite or tournament contests. The contestants focus is directly forward to the threat or opponent. They see, hear and contact only the one individual directly in front of them. Take a look at youtube clips of Aikido, especially those of high level practitioners with three or more uke. This is a holistic approach and if I have it right Aikido'ist start like karate kumite and the greatest difference is as they progress they expand from a atomistic/M-time training approach into a holistic/P-time ability where they are seeing, hearing and grasping in multi-tasking-direction-threat/opponent levels. It seems on the initial view they are moving in more than one direction but notice a type of synchrony where both are actually remaining in a linear kamae to one another and allowing the two connected participants to merely circle one way or the other. This is my view of a false sense of strategy where neither is actually moving off center of the other. They have actually formed a synchrony that is not conducive to combat, fights or assaults outside the sport. Don't even get me started on the "bouncy-bouncy" stuff. This is a one on one and you will see how they move subtly off center and move in many directions. Then it moves to two against one and you see how it is a variety of directions and always moving off center using all sides and directions with a circular aspect indicative of the aikido teachings. This is moving into a holistic approach moving away from the atomistic. No head to head but rather uke direct attack and tori moving off center, etc. In my new term oscillistic the practitioner takes the holistic of the system, breaks it down into its parts or atomistic and then as they achieve proficiency, knowledge and experience they take the atomistic and build a holistic, and personally unique, system of their own where they can move into holistic application that moves back and forth from a slight atomistic to holistic and back as required to apply the system against threats, attacks or assaults. What is the context of your "fun" for the last few posts? Fun: Enjoyment, amusement, or lighthearted pleasure; Joke or tease; Amusing, entertaining, or enjoyable; amusement - joke - sport - jest - lark - entertainment; and this last part in particular - "Behavior or an activity that is intended purely for amusement and should not be interpreted as having serious or malicious purposes." When I spoke of fun I was alluding to the general term defined above which is not conducive to true martial practice and training from my view. Martial Systems are "serious." They are not for fun which many tend to believe is necessary of the taking of classes is not worth it. In this instance they are practicing a sport that is consider a "club" where folks gather to amuses themselves with karate; to be entertained by kata, kumite and the competitive aspects; to joke around with their dojo buddies, to jest to have an enjoyable time. Now, as to what may be the intent and context to Mr. Miller's book when he states something like, "have fun with it," I don't believe his context is what I am stating above. I do believe that my context as to what Mr. Miller is saying is allow yourself the latitude to ease off the intensity of the seriousness of violence, fighting and predatory threats and play with it being allow yourself to think and practice outside the box. Let your mind relax with the practice so what your learning can connect with the minds subconscious and find what really works for you as a martial artist. If your remain always "on" then your stressed. If your stressed then you are handicapped and if you don't allow your mind to let go, have fun with it, then you may not find your true application in a chaotic and conceivable stressful situation. So, in one way yes, have fun with your training and practice but leave the "fun" for those who want to joke, tease, amuse, entertain, jest, and leave all serious stuff outside on the street. There is a difference and it may be fluid and thin but know the difference. Mr. Miller did also state the most egregious error most make is not knowing what it is and thus make a mistake that could be costly. Once again, my view, my interpretation and not necessarily that of Rory Miller. I can express my views as to my leanings but I am not and never are speaking as if I were Rory Miller or any other author, etc. What are your thoughts on belt striping for black belts? Depends on the dojo. Personally I think they serve a purpose and that if a dojo makes use of the system they make sure they are clear as to its purpose and history. There are two systems for belt striping for black belts. 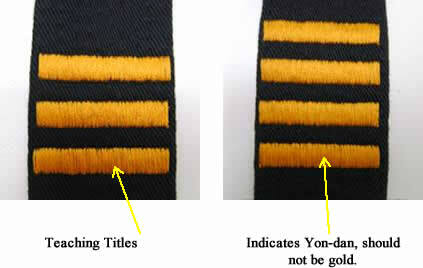 The first is a gold stripe. There are only three gold stripes. One stripe is when a practitioner reaches a level of skill that is deemed extraordinary. This is where one is first recognized as a person of character and one at a level that is considered a Sensei in the true nature of that title. They are awarded a teaching certificate and the title of Ren-shi, 6th level dan-sha at minimum age of 35 years. The second stripe, total of two gold strips, is indicative that person has reached a level commensurate with a professorship. This title is Ren-shi, 7th level and an age of 48 years. The third stripe, total of three stripes, is indicative of a person who has reached a level that they are literally a "model" to those in the martial systems. This title is Han-shi, 8th level dan-sha at a minimum age of 58 years. The second system is one where each level of black belt has a stripe on the end. Although there are no standards or practices governing this system it is best to remain separate and distinct from the three striped teaching title system above. As a black belt I tend to lean toward a stripe of a color that is minimally contrasted to the black belt. Red is a good color that I would use and it has a symbolism for my view as reaching toward the sky, red belt 9th and 10th level black belt. I would add that if you follow a classical martial system, in general, you don't use any stripes on the black belt other than those Sho-go system three stripe gold teaching titles. Now, in regard to the paneled belts, i.e. the red/white paneled, etc.? On special occasions it is worn by 6th level dan-sha up to 8th level where 9th and 10th can wear solid red if they so desire. Don't go searching the Internet for any one group that will validate my view on this. There is one site I am providing that explains the "Sho-go system" and you will find an article in this month's black belt magazine by Dave Lowry on this system. Dave Lowry is better qualified to provide data on this system. In addition, the sho-go system, as well as the second system, until the last couple of decades was none existent. The paneled belt has been in that same status for the same approximate time window. Early Okinawan karate, martial systems, barely used colored belts until the sixties or seventies. At one time there was white, green and black; later white, green, brown and black; then all sorts of colors appeared, etc. Isn't Karate Supposed to be Fun? - Is this true of all martial systems? ADDENDUM: Taking this a bit to the end of the spectrum it occurs to me that to take a martial practice and to make it fun initiates a mind-set that could be a detriment to self defense. Since my views are mostly on making it work in real-world fights, threats and assaults - to name but a few - it would go that my posts such as this might seem to most as a bit to far. Martial arts are serious. Martial arts, classical or traditional, are geared to combat. They are about handling violence with a moral standard that does not compromise the integrity of the system as applied to a threat, assault, fight or predatory violent encounters. The time to institute a bit of fun in martial arts is off the dojo floor. Social contexts are an important aspect of any discipline. It must be understood that there are times to be serious and the dojo floor for practice and training is serious business. There are times to joke, to socialize and to build the clan/tribe cohesion necessary under the heading of "survival or survival instincts of the clan or tribe or dojo." Classical martial systems are not meant to be "fun." They are serious disciplines, serious art forms (as defined by the Japanese Zen Buddhist system) and take discipline, dedication and due diligence to become proficient in applications. This does not mean that classic or traditional forms of martial systems are not to have "fun" but in the proper context, outside the dojo proper during actual training and practice. This would include serious training and practice when conducted away from the dojo proper (although the dojo proper in my mind is any location where practitioners are training in martial systems). Just some thoughts that arrived since the last post on this subject. Be serious, be diligent, be disciplined and stay in the proper mind-set and when all is done for the day, relax, take time and enjoy to company and camaraderie of your fellow practitioners. What is a martial style? Many hear the question and speak only a word. It is karate. 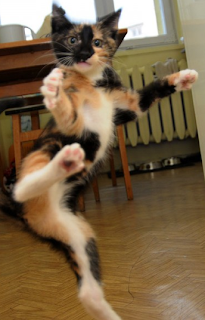 It is Kung Fu. It is Aikido. This explains little to nothing and people make assumptions in lieu of simply asking, "What do you mean by style?" Style is an individualize mark the is expressly representative of a particular discipline. It is an individualized imprint upon the system. It is a particular skill associated with that particular system. It is that something when presented impresses the observer with a particular person, a particular place, a particular belief that says or causes imagery of the mind stating, "this is Okinawan karate," or "this is a southern Chinese Kung Fu," or "this is a Japanese sword art." It is a specific "feeling" one gets when the style's name is given, when a style's art is displayed/demonstrated and it is that system with a unique spin on the fundamental principles that govern all martial systems, styles. A particular style has a unique structure and rhythm, it has a fluency much like languages of differing cultures, it has a unique culture and its precision is governed by the whole of all its parts. Its economy, clarity and dialect speaks volumes of its uniqueness in separation from the flock called martial systems. Style is that which gives it personality much like your personality sets you apart from all other humans. It has a fingerprint so unique it will always be seen in all its variations as that "style." This is what I mean by "style" when you hear me say I practice the style of Okinawan karate-jutsu-do as created by and named by Shimabuku Tatsuo Sensei, a fortune teller, a farmer, a father and family man and a native Okinawan who studied, believed and practiced those ancient classics that so influenced his decision to create a wholehearted system called, "Isshinryu, the one heart style." I have a good deal of fear, respect, for longevity or lack thereof. I also fear those things in the world that could shorten my longevity, what ever that may be. In the karate world I fear being damaged badly but most most fearful thought is having to use karate and the person on the receiving end is damaged very, very badly - crippled at the very least and dead at the worst. My greatest of all fears is the loss of loved ones, that is truly the greatest fear I could face and all others pale by comparison if it were comparable. Recognize all your fears; give yourself permission to have the fear; give yourself permission to still act as needed regardless of your fears. Have you ever had to use your karate? Yes, I use it daily. It's philosophy is a part of who I am much like many things I have experienced and encountered over the last fifty-seven plus years. I am not obsessed but rather integrated with my studies and practice which means most of what I do every single day is a direct result of my beliefs of which the martial philosophies I have are a part. If your meaning was a lot narrower as in have I ever used the physical aspects against another human being then the answer would be yes - with a bit of qualification. Every time you spar, compete or participate in dual/group training where physical contact occurs then you have applied, limited, your use of karate in a physical manner. If your meaning was even narrow as in have you ever used karate to fight then the answer would be yes - with a bit of qualification. I was once swung at by another Marine while on a run and I controlled that situation with positioning and control of that person by the elbow. You may not classify that as either a threat or a fight, it was. I can only say that my initial answer was more critically important than the following two. I would prefer to convey that it is best to live the life without violence, physical and psychological and allowing the dual practice of karate-jutsu-do to balance out the body and mind with the spirit developed in the philosophical guide of the ken-po goku-i then simply learning to fight, compete and promote violent behaviors. Just want to let anyone know who reads my posts that an extracted quote and attached comments by me are NOT to disparage the original source post and it is not to refute or otherwise make a statement that the original source post is right, wrong or other. It is just that sometimes a specific quote out of the context of the original source post, periodical or book triggers a thought, an idea and a topic for a post here - it is not personal and not any of the above. If you feel otherwise let me know and I will make sure I don't extract quotes in or out of context from your blog, periodical or book - send me a private email at my blog email account and I will stop. Isn't Karate Supposed to be Fun? Fun, FUN, karate don't got to give no stinkin fun! I recently read the following quote, "The main emphasis is on having fun while getting fit, strong and learning practical self defence," and had to give this some thought whereby the above question/title occurred. I really don't feel a classical/traditional form of karate-justu-do is supposed to be "fun." I would allow that for me the entire process has been the most enjoyable and beneficial endeavor ever - for me, but not strictly "fun." When I think of fun I think of those times running and swimming at the beach, the diving and swimming at my favorite swimming hole or the time I sat on an old log with my cane pole dipping into calm waters striving to catch catfish. Even if I turned this toward say basketball. Yes, you can have fun with that sport or you can enjoy that sport or you can not have fun and spend the time, effort and determination in becoming the best basketball player ever which I can say may involve some fun but more hard sweaty not so much fun "work." My practice inspires me, it helps me to grow and it provides some periodic enjoyment - fun, it is not fun. Does kata allow us to practice potentially lethal or destructive techniques without destroying training partners? First, I am a kata person. I believe in kata. I believe that kata is the keystone to karate-jutsu-do. I believe ..... but ...... I don't believe that kata provides practice for "potentially lethal or destructive" techniques. I believe kata are merely blueprints or story boards that provide karate-ka a means to pass down possible techniques that were perviously derived from those that were proved by individuals to "work." I believe they were and are the best method to pass down those working techniques. I believe they are and always will be the best method to pass down those working techniques for the future of martial systems - karate-jutsu-do. The key issue here is kata were those techniques found by person or persons who then put the working, validated, techniques into kata for the future but were and are not written in stone but meant to be merely a stepping stone for the future generations to "find or discover" those techniques that work for them in this time and in this place and at any moment in time. It bothers me a bit when someone preaches that kata are the "potential lethal or destructive" technique source or sources. As an individual I have no clue as to whether the inherent techniques of the classical kata will work - for me, at this point in time, the present moment of a threat. No one can know. You can't know that the bunkai, if the original classical bunkai originally intended by the master who created the kata, of your kata work or not until you vet then yourself. There are way to many variables involved not the forget to mention that as time passes the translation and meaning will change naturally as is the inherent trait of the human and the human brain. A pet peeve, the kata are the blueprints of your perception and application of karate-jutsu-do, not the old masters. Your merely taking their fighting wisdom of that time and place and "making it work or adjusting them to work" in your time and place. I would rather have the advice and teachings of an experience practitioner, combat experience or out there in the threat making it work, than one who never encountered a true threat and lived to teach about it. A person with at least one fight under their belt as a karate-ka then a gazillion Sensei who never once came face to face with a true threat either social or anti-social predator. So, do kata allow us to practice potentially lethal or destructive techniques? No, not at all but they do provide us experienced and proven techniques, if still of the original classic bunkai, that "could possible" help us to "find those effective techniques." I would prefer defining them as effective vs. lethal or destructive. As to lethal or destructive; I prefer to have a mind-set that says I will effectively stop the damage then assume that I have to have either lethal or destructive mind-set to stop damage with lethal force or destructive force. These tend to express aggressive intent which of course is fighting and of course we all know fighting is illegal. I feel the mind-set of kata is important, can you tell?